Koh Phangan Diving offers a good range of dive trips on the best dive sites in the Gulf of Thailand. These trips are run almost on a daily basis and give you the opportunity to explore and discover our local reefs with the team. They take care of all logistics for you and make sure that everything runs smoothly in the most enjoyable way. All you have to do is put your gear and fins on and dive. In one day we have access to dive sites like the famous Sail Rock or Chumphon Pinnacle. We can also cover sites closer to Koh Tao like Shark Island, the wreck of the HTMS Sattakut, South-West Pinnacle or White Rock. Our location on the west coast of Koh Phangan gives us a quicker and shorter access to the Ang Thong Marine Park where we can dive on many sites like Koh Yippon Lek or Koh Wao. We also try and propose with groups to go to the less explored sites like Samran Pinnacle or the Lighthouse. On the day trips, dive sites are picked daily according to conditions and other factors. This with the goal to offer the best dives we can to our customers. Day trips normally start in the morning at around 8:00 AM and finishes back at the dive center at around 15:00 or 3:00 PM. For dive sites that are further out, the day ends at around 5:00 PM or 6:00 PM. Our daily trips are split into 3 zones according to distance with the option of 2 or 3 dives. 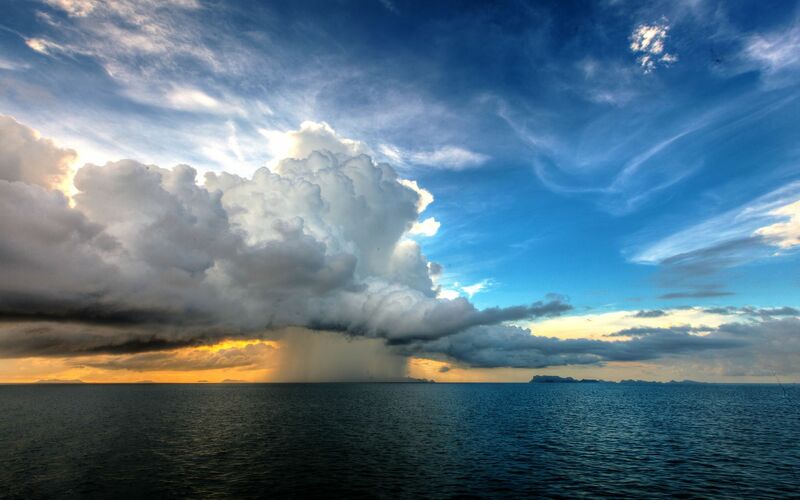 On the way back from one of the trips with a storm over Ang Thong Marine Park at sunset. We offer dive trips for sunset and night dive. As it is not a common occurrence it is important to ask about the schedule of these trips. Sites we go on sunset and night dive are mostly Sail Rock or we make it as a local trip to Koh Ma and Mae Haad. It is possible that other sites are selected but these are the one offering the best night dives. These trips usually start with the preparation at around 4:00 PM. It is a good idea to take advantage of the sunlight to get the gear together and prepare. Sunset and night dive trips end at around 7:00 PM to 9:00 depending on the number of dives and the location the trip took place. If you really want to see Koh Phangan local marine life. It is possible to do dives from the beach. The bay and beach of Mae Haad or Haad Yao are nice for diving. Sometimes conditions or weather is not good away from the coast. We can also dive from the beach locally to be protected in the bays surrounding the island. These dives are also better suited for some courses or programs. They can be selected by your instructor to better fulfill the course requirements. Beach diving is less restrictive than from a boat in the sense that, they can take place in the morning or in the afternoon around 1:00 PM. In fact, these dives are mostly timed with tides, visibility, and waves. It is possible for groups to organize trips with a private boat. These custom trips can even accommodate a small group of 4 people for a few nights. Our catamaran has two rooms and everything needed for autonomy.